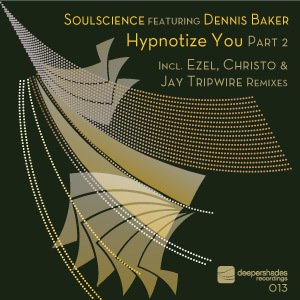 Fresh off the increasing success of the Marco Fracasso “Xiba Chant” EP (DSOH012) featuring mixes from Mindtech, Lars Behrenroth, and Jojoflores, DEEPER SHADES releases the second part of Soulscience featuring Dennis Baker “Hypnotize You” (DSOH013), with remixes by Ezel, Christo, and Jay Tripwire. Ezel of Yoruba/Ocha fame, recently mentioned by Louie Vega as one of his current favourite producers, is building a growing following for himself in the international Deep House circles. His remix breathes new energy into the track using bright, infectious, bouncy key riffs and his signature spiritually driven Afro Caribbean rhythms. This remix is for the soulful house crowd and will be a guaranteed dance floor staple for months to come. Newcomer to most, Christo, who has collaborated with and remixed for Atjazz (“The Brighter Side” by Version and “Roll of the Beast” by Clyde) delivers a smooth, deep, rhythmic, organic mix entwined with a mellow pad line and throbbing bassline which bring out the haunting vocals. His dub mix strips it down to a relentless pulsating bass led tech groove. Jay Tripwire (Tonality) takes the previous DKMA mix and reconstructs it into a more dance floor oriented cut, bringing the interplay between the vocal hook line, pulsating bassline, and tech style synths to the forefront and merging them into a mesmerizing groove. Another great set of remixes... these are once again very fresh... Christo's dub being my preferred attack here! Wow! Man, that's why DSOH is becoming one of my favorite labels! Deep and elegant. Getting electronic in the right way and always soulful! This EP proves that, congrats! Especially the Christo and the Ezel's mixes. Will rock them for sure!!!! All the mixes are for me on that DSOH013. Loving it. It's hard to make a choice on a fav mix cause each mix is playable for a different part of the set and also the mastering sounds good. Yo Lars, u really representin' the west coast in a great way. Keep it up homie! Have to say im wit the Ezel Mix, thats my fav rt now. I'm diggin' Christo's Dirty Dub and Ezel's Instrumental remix!!! thx a lot for sending me this release! It's all about Ezel's interpretation on this package - what a journey - love the flow he delivered and Dennis Baker's vocals fit right in there. Love it!! Feeling the release. Ezel's mix is the one! Awesome set of mixes..Difficult to choose 1.. I like them all!! The Ezel Mix is kick ing! Also love the Dub! Top release... something here for all the deep heads. The dubs are straight in to my bag. Thanks. Deeper Shades Records drop part two of "Hypnotize you" by Soulscience, a wonderful production featuring heartfelt vocals by Dennis Baker. Ezel kicks things off with a deep and groovy yet infectious, afro rhythms driven remix fueled with melodious keys and chords. Next, Christo smoothes the vibe down for a mellow yet mesmeric journey with a dreamy touch. His hypnotic dub roughens the vibe with a vibrant tech-soul groove and moody chords. Finally, Jay Tripwire reworks the 'DKMA Remix' into a nine minute epic that puts the contaminous synths center stage. real good overall, some for every taste. I'm into the Christo's Vocal Remix, real groovy and forward pulling. O n a soulful tip, the Ezel is real good too. full support... many thanks for this. Thanks for this single ! It s all that I like to play to begin my parties ... I like the sounds & beats , & the voice is deep & soul like I want ! Really like the Ezel remixes. The others are less my cup of tea. But will play those others for sure. All are lovely tracks but for me it's Christo's Dirty Dub all the way! Quality sounds once again from the DSOH camp!! Great Package of remixes !!!!!!!!!! LOVE IT !!! lovin the ezel mix , good work. Like this, deep and soulful nice keys and vocals. Really like Ezel's remix. Will be giving it some airplay. liking the christo mixes deep! Good stuff right here. Will play it today on Tea Party Music Live! Ezel's mix is dope. full support. Feeling Ezel's remix the most but all mixes here are good. Very good overall package. My favourite is the Ezel's Remix. Very nice, deep & soulful, love it! Christos dub for the club but feeling all the mixes. Ezel mixes are the ones for me! another top quality from Deepershades, keep rocking! Deep and soulful, perfect for my radio show! In a time when many tracks sound the same this one stands out. Ezel's mix is one for me. Hey Lars, thanks for this. Original is nice and soulful but its Jay's DKMA remix that's the one for me, deep and tracky. On it. Wonderfully arranged deep and soulful tracks with a touch of latino feel. Very nice! Lovely vibes that reach straight for your soul. Very nice remix package! Tripwire mix is the one! Nice deepness boy! Love the Ezel's remix, nice atmosphere, will play! Massive vibe! Will play this, thanks!!! Nice package that compliments Pt.1 well. More choices = more flexibility in sets. Jay s remix is Dope!!!!!!!! !Elegant and groovin! Ezel remix is very good too!!! Full support! Pretty dope mixes! Love theam all. Will play a lot. Thanks! Wow! Fantastic release. Really love the melodic qualities on all the mixes. Jay Tripwire's has that excellent swirling build, and E zel's wins with those sweet chord changes. Priority spin for me. Great soulful vibes much needed these days. Very nice! nice deep package !!! the jay tripwire rmx is great ! !